A good recipe is a gift that keeps on giving and finding one is always a thrilling experience. Enjoy recreating the goodness of some of our family favorites. May they fill and nourish. 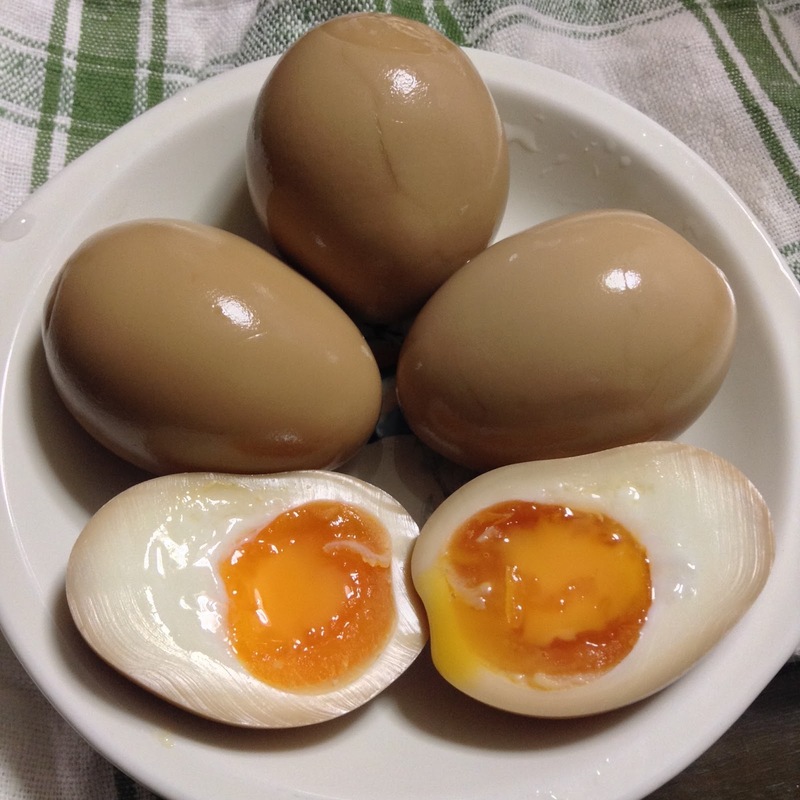 A hearty bowl of ramen wouldn't be complete without an ajitsuke tamago, that perfectly boiled egg with a golden gel of a yolk, and delicately marinated on the outside. For a long time, I thought it was impossible to cook eggs like these -- I either end up with hard boiled eggs with powdery yolks or soft boiled eggs with runny whites. Here is how to make these eggs to upgrade your ramen bowls, or simply to enjoy them on their own. Boil enough water to cover your eggs completely. Prepare eggs by piercing them with a pin on the flatter end. When the water comes to a rolling boil, add the eggs by lowering them one by one into the water. Lower the heat until just barely boiling and start timing for exactly 6 minutes. Turn off heat, take out eggs and run them through ice cold water. Gently peel the eggs under running water. In a bowl, prepare the marinade consisting of soy sauce, mirin and sugar, in approximately 1:1:1 or 2:2:1 proportion. Soak the eggs. Turn them every so often to coat the eggs evenly. You can soak them overnight. Given the choice between potatoes and sweet potatoes, I'd pick potatoes anytime. My parents used to put chopped up pieces of orange sweet potatoes into their rice gruel. I don't doubt it was nutritious but it just didn't excite me. Until I discovered glazed Japanese sweet potatoes. Done well, these beautiful morsels had a slight crust on the outside which gives way to a soft inside. I have two versions of this and the difference is only in the sauce you toss the sweet potatoes in at the end. For both versions you need 1 big or 2 medium sized Japanese sweet potatoes, oil, and black sesame seeds. Glaze for version 1: Taste like apples. Glaze for version 2: Savory sweet. Wash the sweet potatoes. Pat dry. Wrap in aluminum foil and bake in 350-400°F for 40 minutes. Cool. Chop into bite sized pieces. Heat oil in pan. Toss the sweet potato pieces until slightly browned and crisp outside. Pour the sauce for glaze. Toss quickly coating all pieces. Add the black sesame seeds. Remove from heat and serve. I confess I used to buy those individually packaged Market O Real Brownies Original (from Korea? Japan?). At almost $2 for a small square inch piece of sweet, I only bought it to celebrate something and they were always too small to satisfy. Then I graudated to making brownies from Trader Joe's brownie mixes and you can only get a package or two to last you until your next trip to the US. Then one day I decided to make them from scratch. My neighbor said brownies are hard to mess up but that's not true. I've baked hard and dry brownies and overly sweet messes. I've made brownies that were sorely lacking in nuts. My dad likes to say all those mistakes are our tuition fee. I've paid my way to Better than Market O Brownies. Cream butter and sugar. Add eggs and vanilla. Mix in cocoa and flour. Fold in chopped walnuts and chocolate chips. Pour in parchment lined pan. Bake in preheated 350°F oven for 20 minutes. First 12 minutes covered in foil and last 8 minutes uncovered. After exactly 20 minutes take out of the oven to cool. Do not leave in the oven to cool or the brownie dries out. Gone are the days when I used to make cheesecake with unflavored gelatin. I got ahold of a proper cheesecake cookbook and learned how to make ちゃんと chanto (Japanese for "doing things properly") cheesecake. This is the classic cheesecake made even more tempting with tart raspberry sauce. It can be made in advance and frozen. A timeless treat sure to impress. Mix together all the ingredients for the crust and press into the bottom of a lined springform pan. Bake in preheated 325°F oven for 8 minutes or until lightly brown. Cool. Mix softened cream cheese with sugar. Blend in eggs. Add flour, zest and heavy cream. Mix until smooth. Pour over the crust. Bake in preheated 400°F oven for 10 minutes. Reduce temperature to 250°F and continue baking for 35-40 minutes or longer until just barely set. Turn of the oven, leave the door ajar and let cool in the oven for 1 hour or longer. Chill. For the sauce, put frozen raspberries in a food processor. Add sugar to taste. I like it on the tart side so just a little sugar works for us. Also known as apple crumble or apple crisps. If you're craving the homemade goodness of an apple pie but do not quite feel like rolling pastry, this might just be what you need. I love the sweet crunchy granola-like topping which contrasts with the tartness of the lemon and apples. Celebrate autumn with this dessert. This recipe serves 2-4. Toss apple in lemon juice, half the cinnamon and half a tablespoon of sugar. Spread in a baking dish. Combine butter, sugar, cinnamon and flour in a bowl until well incorporated. I use a fork and then work it further with my hands. Add the oats and the chopped pecans. Spread this topping over the apples. Bake in 400°F for 15-20 minutes until topping is browned and apples are tender. Considered a nut in the culinary sense, pecans are actually a drupe or fruit with a single pit surrounded by a tough outer husk. Before European settlement, pecans were widely consumed and traded by Native Americans. They were a natural choice of food source as they can provide two to five times more energy per unit weight than wild game and require no preparation. A rich nut with a buttery taste and texture, pecans are considered a super food high in protein and low in carbohydrates, and an excellent source of fiber, vitamins and minerals. A favorite in pies (pecan pies are traditional to southern US), pecans are also the main ingredient in pralines (candy). I have posted a recipe for glazed almonds, but our family prefers the "softness" of pecans. In this stovetop recipe, I toss pecans in butter in a wok and this results in a moister nut than the baked and no butter version. Heat pan or wok. Melt butter. Toss pecans and coat. Add maple syrup and cinnamon and mix until well incorporated. Be careful not to burn. Entire process takes less than 5 minutes. Eat as is or top on your favorite breads and pastries. 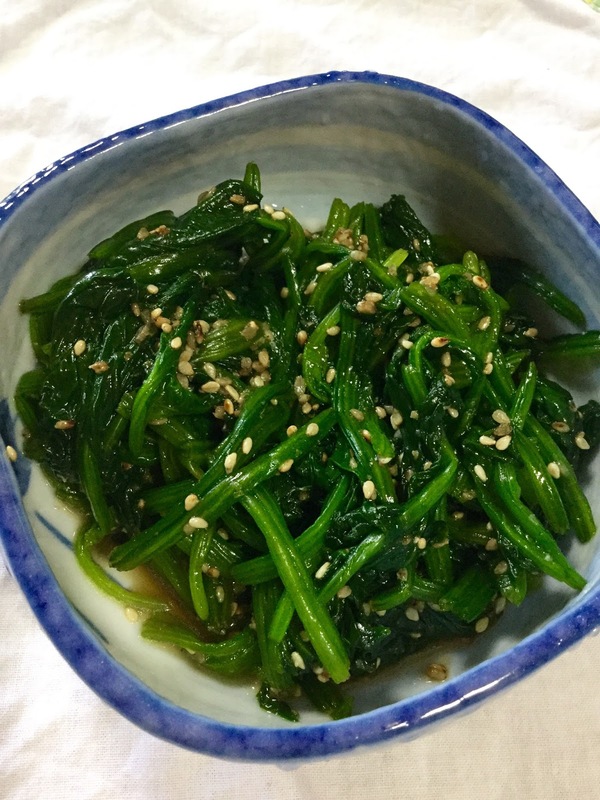 My kids are not particularly excited about spinach, except when I make this dish. Then, there's never enough and they fight for the last bits. So easy to prepare -- it is my go-to dish when I want to add some green to our meals. Mix all the ingredients for the sauce in a bowl and set aside. Blanch spinach in boiling water for 20-30 seconds until just wilted. Drain. Rinse in cold water until cool. Slice into 1-2 inch long strips. Squeeze out excess water. Mix with the sauce. Serve. Good even when cold.